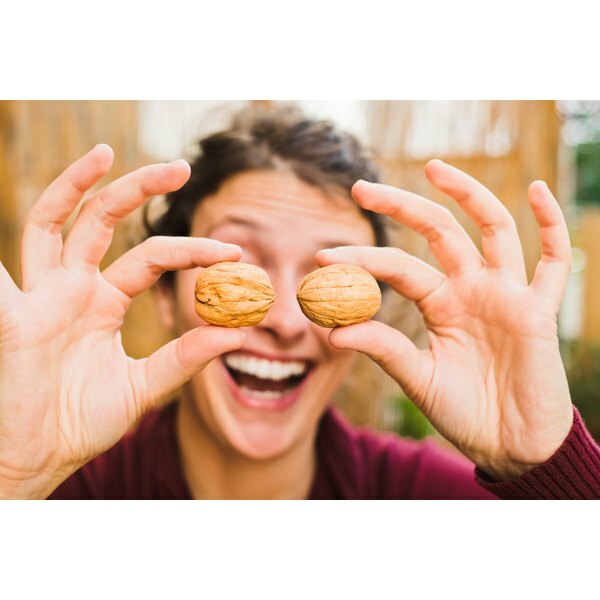 A woman making a silly face with walnuts. 1 Can You Tighten Facial Skin With Cold Water? 4 Do Carrots and Lettuce Have Carbohydrates? "Knock-knock." "Who's there?" "Beet." "Beet who?" "Beet-cha didn't know that healthy eating can be fun!" Whether you are a parent convincing your kids that spinach is tasty or a health care provider encouraging your patients to eat well, it may help to take a light-hearted approach. In addition to facts about the benefits of good nutrition, add fun tidbits to your arsenal of information. There are lots of fun facts about fruits and vegetables. For instance, the average American eats 10,000 carrots over the course of his life. You can drink a glass of water or eat a cantaloupe -- the fruit is 90 percent water. The world's largest squash was the size of a young elephant -- weighing in at over 900 pounds. If you tried to count the kernels on an ear of corn, you'd be at it for a long time: The average ear has 800 kernels. Produce isn't just healthy, it's interesting, too. You might think a tomato is a vegetable, but botanically speaking, it's a fruit. A fruit is the mature ovary of a plant, so squash, pumpkins, cucumbers, peppers and eggplant are also included in the category. Vegetables are the part of a plant you can eat and are categorized depending on which part is edible. For instance, carrots are classified as root vegetables. More than half of your body weight is water. Every single cell in your body requires water for metabolism and waste removal, so hydration is an important part of a healthy diet. Because your body needs water, water is your best beverage option. If you don't like the taste, try infusing it with flavor by dropping berries into your glass. Avoid sugary sodas and juices that are packed with calories and light on nutrients. Keep in mind that only 80 percent of your fluid intake comes from beverages. The remaining 20 percent comes from water-dense foods like fruits and vegetables. While many people eat both vegetables and meat -- called an omnivorous diet -- some individuals eschew animal products. Vegetarianism is the umbrella term for a meat-free diet, but there are different levels of stringency. Vegetarians who don't eat any animal products -- including eggs, milk and honey -- are called vegans. Lacto vegetarians don't eat meat, fish, poultry or eggs, but they do enjoy dairy products. Ovo vegetarians refuse dairy but eat eggs. Lacto-ovo vegetarians eat eggs and dairy but no meat, fish or poultry. Healthy eating should be fun. Expand your palate and try a nutritious dish from another country. You might make an Indian vegetable curry or an Ethiopian lentil stew. Wrap vegetables and seafood in rice and seaweed for a Japanese delicacy called sushi. Vegetarian Society: What Is a Vegetarian?